Project TR40 - what is it? Most of my friends and colleagues think it won't get finished, and based on past experience I'm inclined to agree with them! Despite this, I'm giving it my best efforts and hope to get onto the interesting stuff before the initial wave of enthusiasm fades. Mains wiring complete and transformer connected. PSU section completed producing 12.6 (regulated), -140, +140, +300 and +900 volts (eeek!). The 12AX7 microphone amp is now working. Next job: TX audio cathode follower, xtal BFO/CIO and diode balanced modulator. 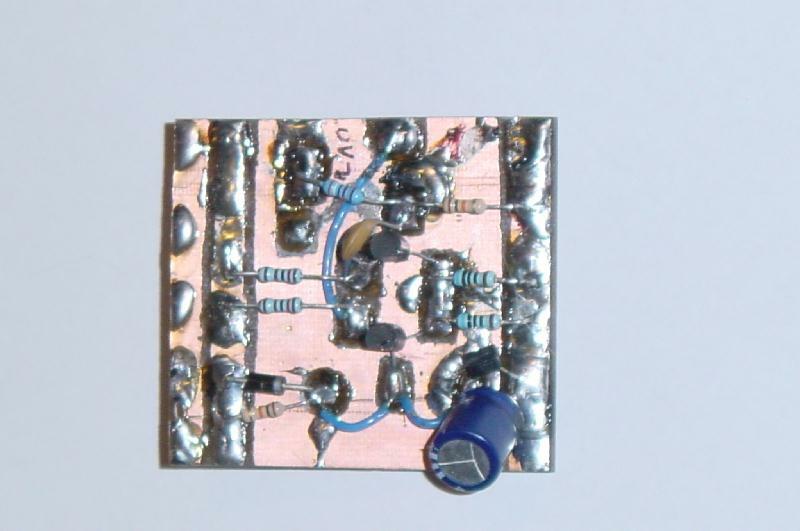 The design has a single IF frequency of 4.43 MHz and uses a 2.57-2.67 MHz VFO to heterodyne to / from the 40 M band. I've 12 signal tubes in the design (eleven 9 pin and one 7 pin) together with four 7 pin VR tubes and two 807s which have their own unusual 5 pin base. I recently bought ten NOS RCA 807s for £20 (about $30) - no boxes though. Apart from being rather tall (as compared with 6146, 6JB6, 6JS6 etc.) they'll make a great set of finals for this radio. To make the unit have the lowest overall height I decided to mount the bases for these well below the chassis. The (initial) valve line up is: 12AX7 mic amp, 6C4 cathode follower, 12AT7 BFO/CIO & cathode follower, 6BY7/EF85 IF amp (tx & rx), 6BY7/EF85 2nd rx IF amp, 12AT7 balanced tx mixer, 6BX6/EF80 driver, two 807 in PA. The rx mixer is a 12AT7 (in a "Pullen" configuration), IF amps as noted, 12AT7 product detector, 12AX7 AF preamp & AGC amp, 6AB8/ECL80 AF o/p. The VFO uses a 12AU7, the 2nd section as a cathode follower. By using the 9 pin EF80 and EF85 pentodes I buy a little extra flexibility as there are at least 2 other members in the EF80/85/183/184 family (that's 6BX6/6BY7/6EH7/6EJ7) which, although sharing an identical pin-out, have very different characteristics. 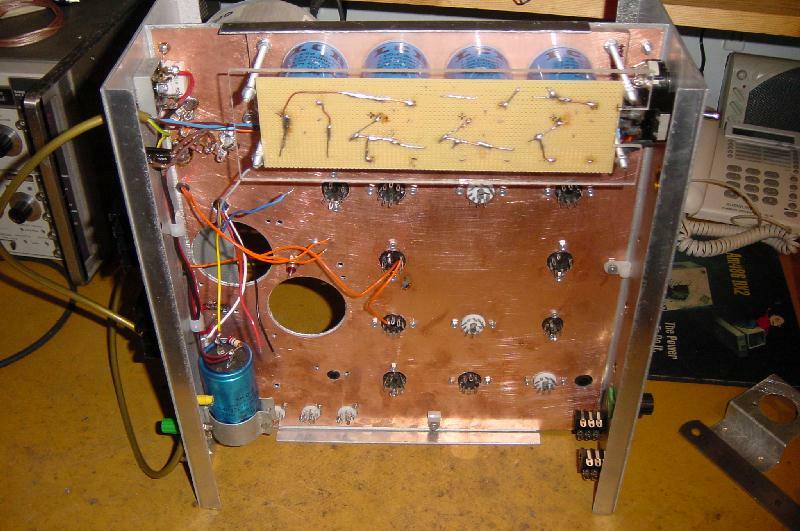 All valves (except the 807s) have 6.3V 0.3A heaters (and/or 12.6V 0.15A for the double triodes) and so by employing a series-parallel configuration can be arranged to use a 12.6V heater supply. The 6.3V 0.9A 807 filaments are connected in series. To keep mains hum out of the design DC is used for the heater rail. To help keep the VFO stable this 12.6 V rail is regulated and also "slow started" to prolong the life of the valves used. This 12.6V rail also powers the various relays used for T/R switching etc. Click on any of the pictures to see a larger version of them. The aluminium chassis sheet, just before bending. 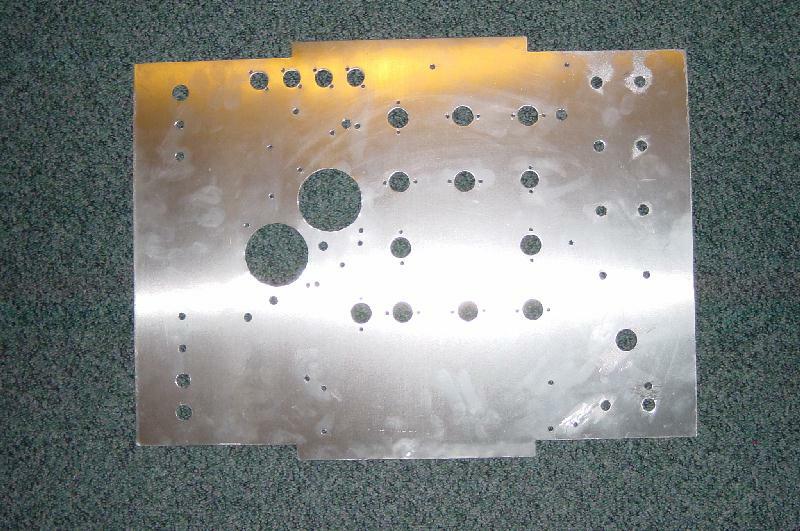 The holes in the rightmost and leftmost portions of the sheet are those found in the lower half of the front and back panels respectively. An early front view. The speaker has been fitted but the (small) meter and most of the controls have not. Side view. The "sandwich" nature of the chassis and front/rear panel assembly is clearly visible in the large version of this shot. 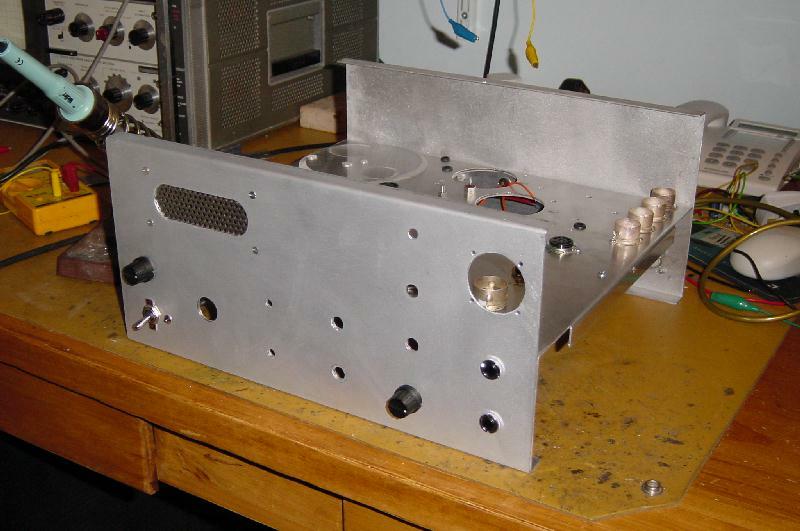 The custom transformer helps make the radio a little more compact and easier to construct. 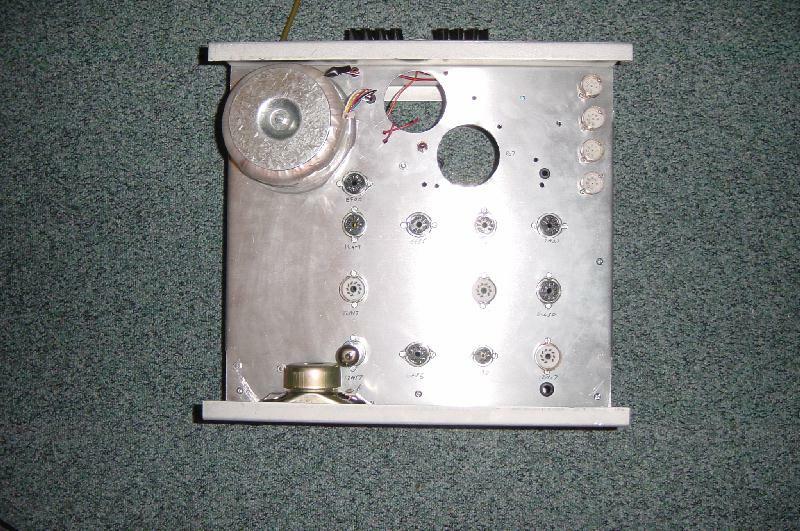 The underside of the chassis has a piece of copper clad PCB sheet bolted to it, drilled almost identically to the upper face of the aluminium chassis. The small valve bases go through both sheets and the many mounting bolts keep these two sheets firmly bonded together. 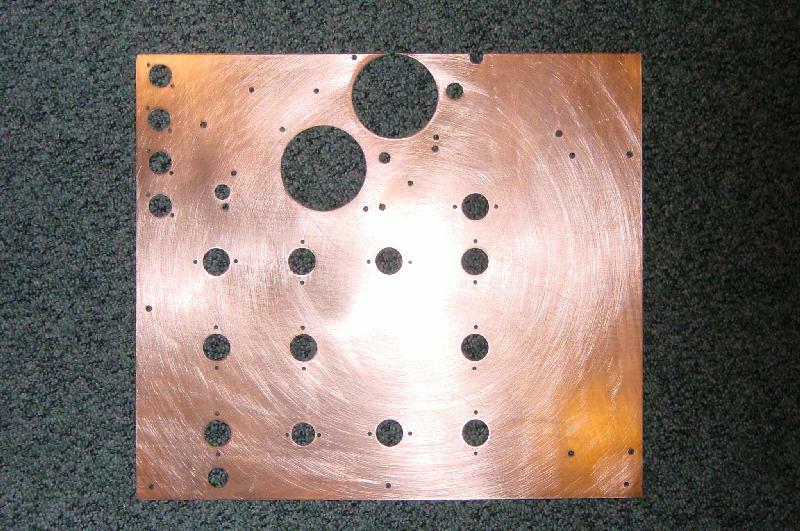 The copper surface allows components and screening sheets to be soldered directly onto this ground plane. Even by drilling both the sheets simultaneously, it was still a painstaking process to produce these parts. The HT capacitors are behind the perspex sheet. 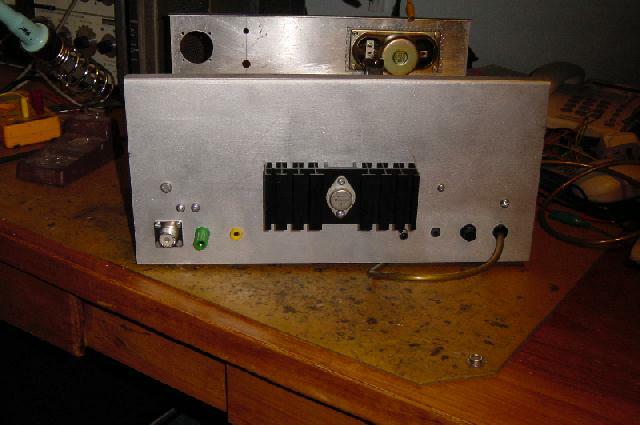 This assembly produces 300 V and 900 V DC from the 210 V, 750 mA AC winding on the transformer. In total three 1 kV 3A diodes, four 470 uF 385 V capacitors and four 100K bleed resistors are used, with 3 fuses too! An underside view. 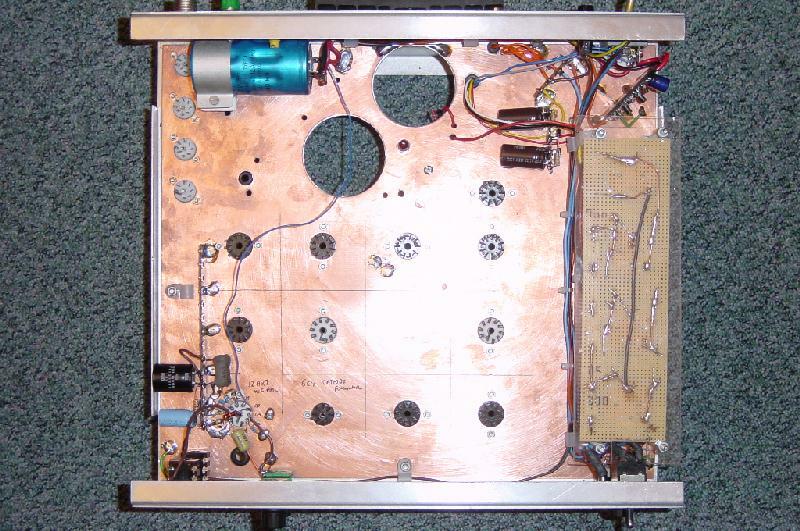 The microphone amp can be seen in the lower left of the picture, the voltage regulator board on the top right, mounted on it's side. 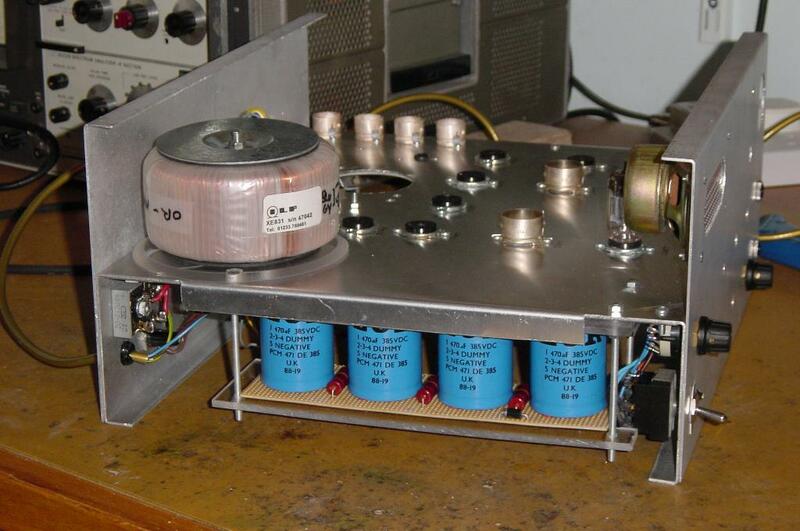 The large single capacitor is the 10,000 uF unit used in the filament supply circuit and the two smaller capacitors next to the regulator board and HT capacitor stack are the +/- 140 V supply. The control board for the 12.6 V filament supply regulator. This circuit drives the gate of the power FET mounted on the back of the case. A "long tailed pair" made from two PNP transistors is configured as a comparator with a 2.5 V band-gap device being used as the voltage reference.